Seeking out a floral gift thats darling and delightful? This charming mix of fresh blooms in ripe, fruity shades of raspberry, peach and cherry is a tempting pick-me-up for any day of the week. Send one to a favorite friend to brighten up their day. 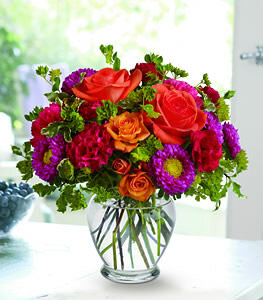 Hot pink, red and coral flowers such as roses, Matsumoto asters and carnations - accented with greenery - is delivered in a glass vase.